Will we see you tomorrow at the coolest little BIG Farm Fest 2018. We’re so proud of Fable: From Farm to Table for having another successful year of growth! We had a great time catching up with community last year at Farm Fest and this year looks like it is filled with more of everything good. 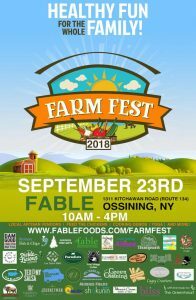 Stop by our booth and learn about pesticide free lawn care, sign our Resueable Bag Inititiave petition*, make a tee-shirt tote, learn about Green Ossining initiatives, or just stop by to say hello.